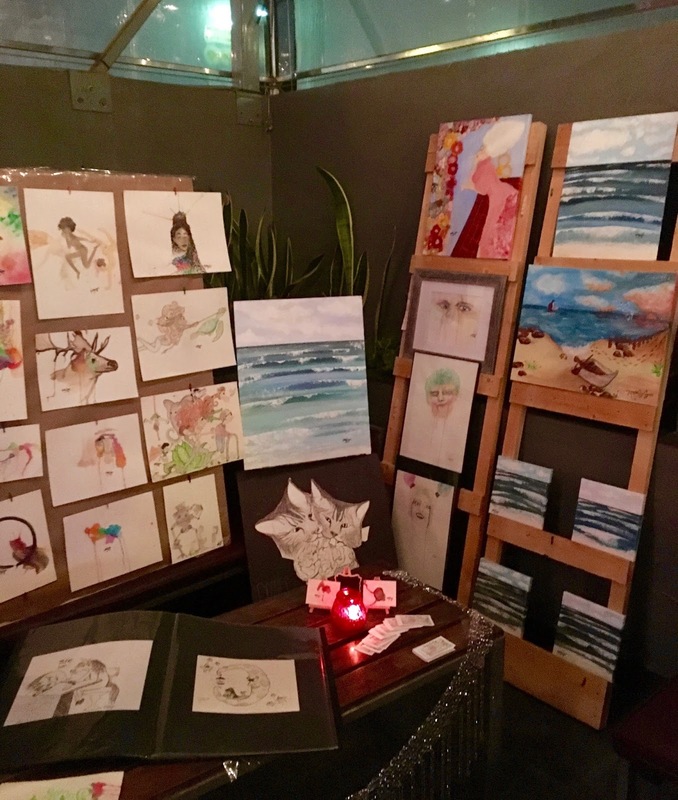 The March edition of the Venice Art Crawl was held last night, and people were out in force, despite the blustery chill (for Venice). My Mom had just arrived to town, so got to experience her first V.A.C., and as this time around it was all concentrated in one area - Windward - it made it that much easier for us to get around. We got to chatting though, and thus, got a late crawl start and had to hustle just as much as usual. But it was worth it, as usual. 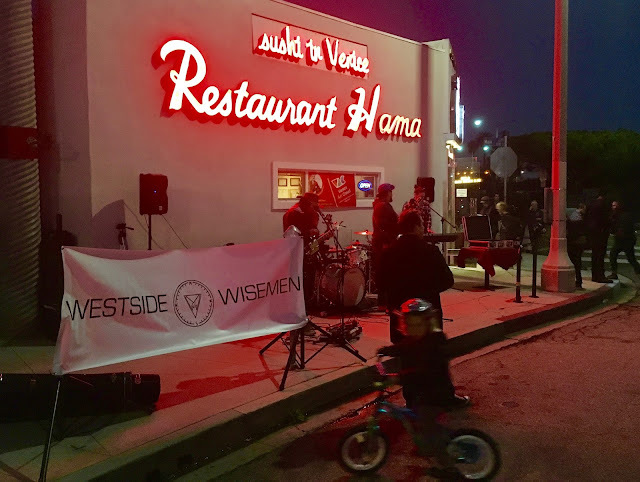 The Westside Wisemen were playing live music on the sidewalk in front of Hama Sushi, welcoming us to the proceedings from blocks away, and adding to the festive vibe in the streets. I think my favorite piece of the night was also on the sidewalk in front of Hama, this great beachy work by Sergio Padilla. Want it. I looked for Tonan's art stop, but didn't see it, so we zipped up to Surfside, as I'd been told that was the headquarters to get maps. 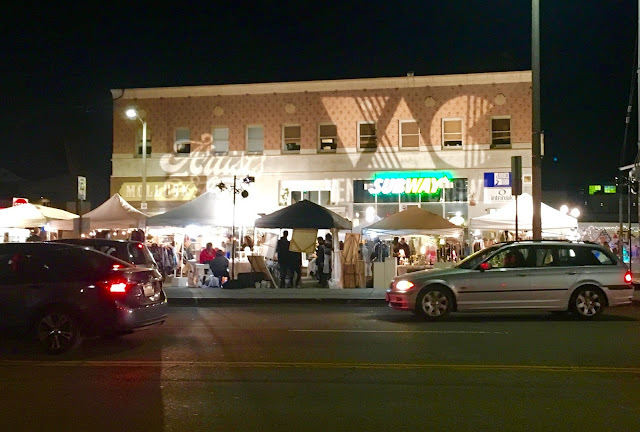 The streets were full of art revelers, and a good time was being had by all. 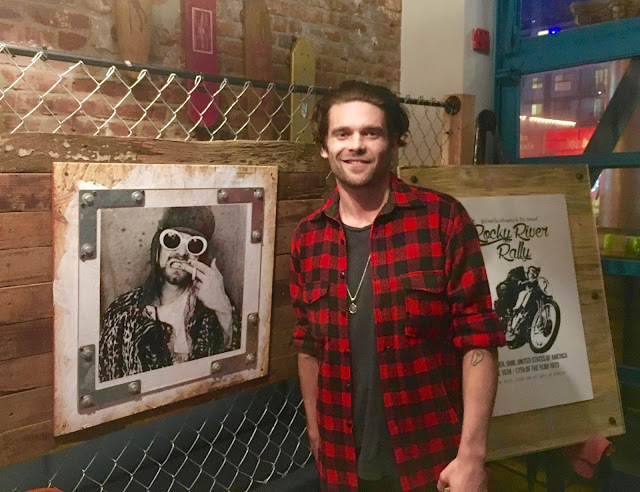 The art in the house was really great, as we were greeted right inside the door by the work of Ryan Patrick McGuire of Ink and Lumber. Real coolly framed photos and designs, the best one featuring Kurt Cobain. Dug it. 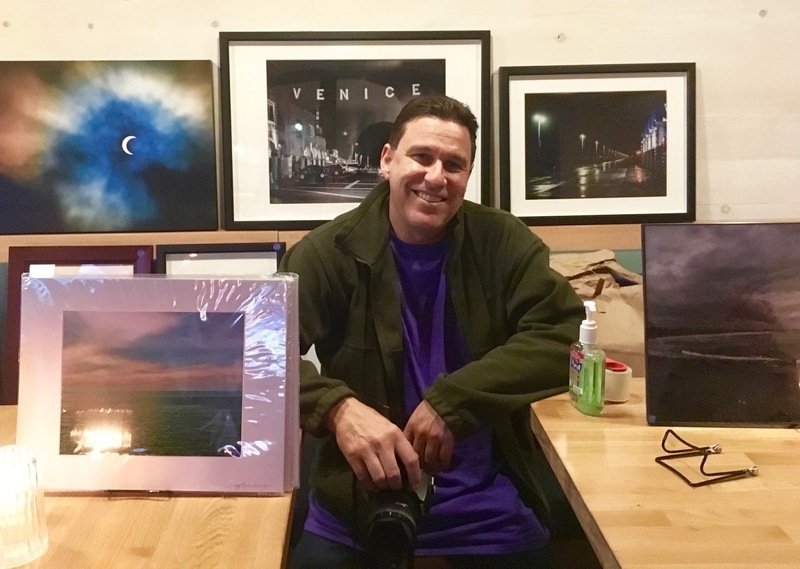 My homie Ray Rae was showcasing his gorgeous Venice photography there also, and holding down the information fort. 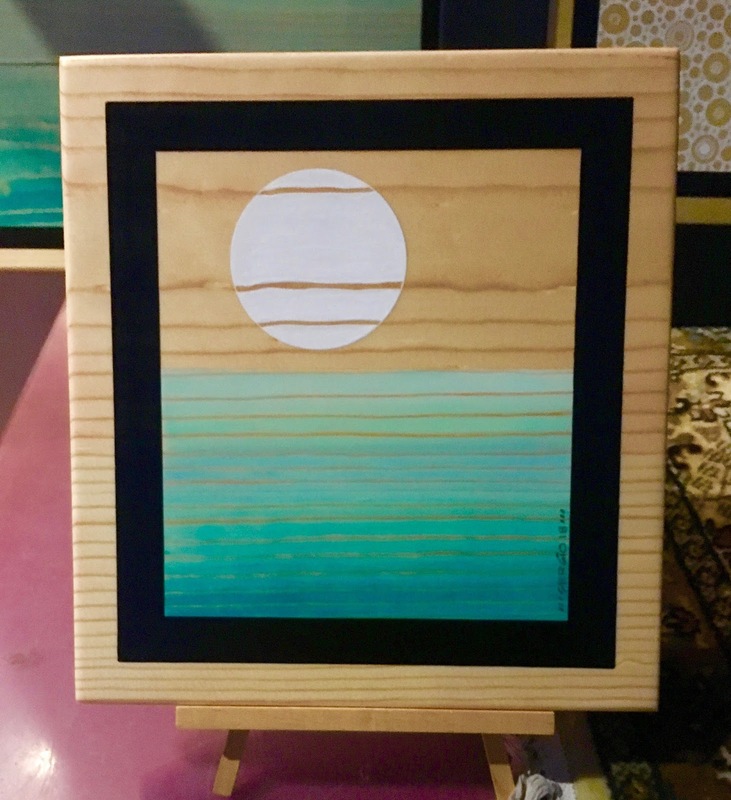 Everyone should have a piece by Ray Rae. 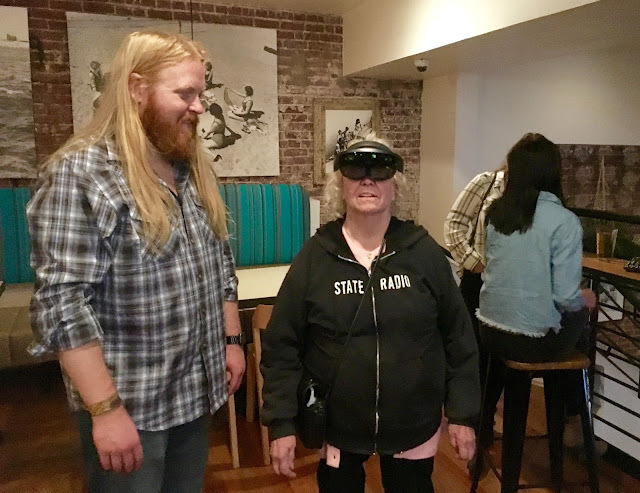 Upstairs at Surfside there was a trip-out interactive hologram experience put on by Cody Nowak, an "AEC Disruptor". Mom got to put on the headset and check out little characters popping up around the room, like monkeys and unicorns and ballerinas floating around in space. This stuff is going to change the entire world of entertainment before we know it, and the art world is already feeling it. I charged through Larry's to see the work of Molly Wiggins, David Downs, and Aisha Singleton, as well as the always great video installations of Olly Bell. People were digging it. There was a special edition of Artists & Fleas going down in the parking lot of Great White, complete with a big VAC projection for good measure. DJ music added to the fun, and folks were grooving. I had to race over to the Erwin Hotel in the middle of it all to see some of the wonderful women artists of Venice being honored for their work. As we're on Venice Standard Time, it didn't start on time, so I ran out to see more art while the got it ready. 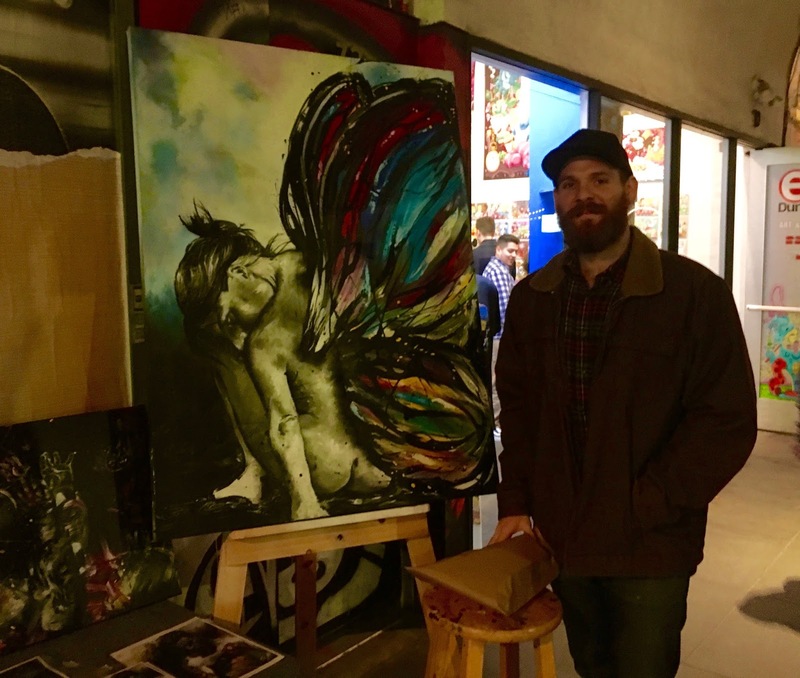 I'm glad I did, because Noah Gottlieb was showing his work on the sidewalk in front of the Bank Of Venice, and it was great. Like Realist meets Fantasy stuff ... from a local cat. Check him out. 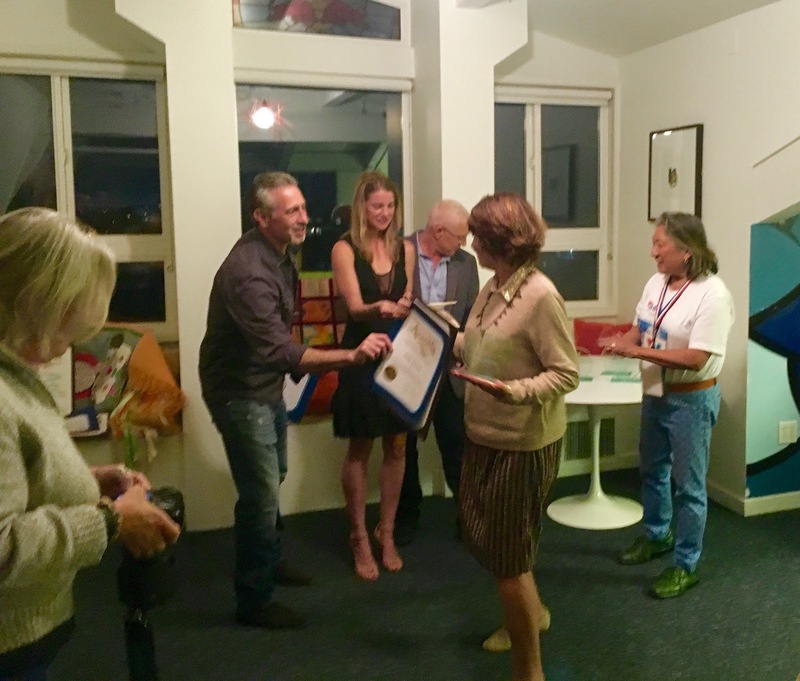 Back at the Erwin, a bunch of us squeezed into a tiny room, where Mike Bonin, George Francisco, and Sunny Bak gave plaques and certificates to the eight women artists of Venice being celebrated appropriately in International Women's Month. 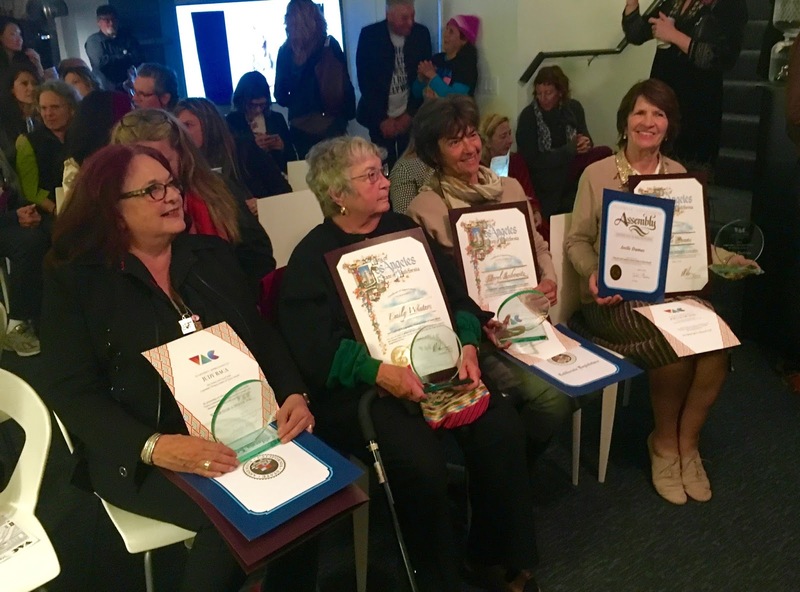 Judy Baca, Joelle Dumas, Emily Winters, and Meryl Lebowitz were there to accept their awards and be applauded, while Jules Muck, Jean Edelstein, Christina Angelina, and Lucy Walker were no-shows. It was great and touching to toast these trailblazers, as women who have helped to shape the Venice art scene ... some for decades, some bursting out more recently. Treasures all. The ceremony took a while, so I wound up missing a bunch of art, but that's how it goes. 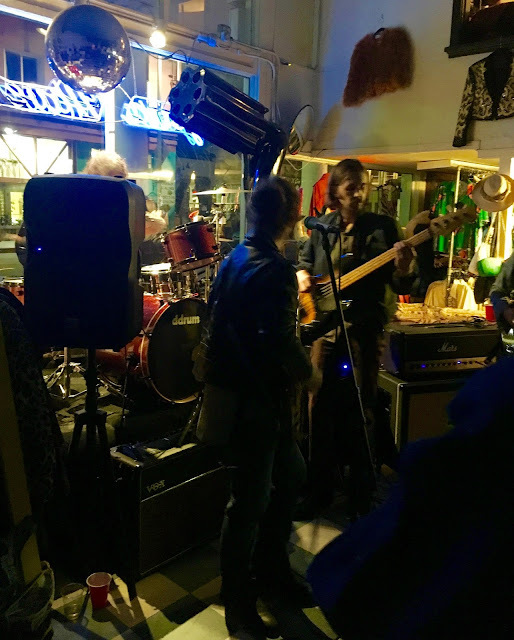 I hit up Gotta Have It, whose crowd was spilling out on to the sidewalks as a live band tore it up inside the packed and awesome vintage store. 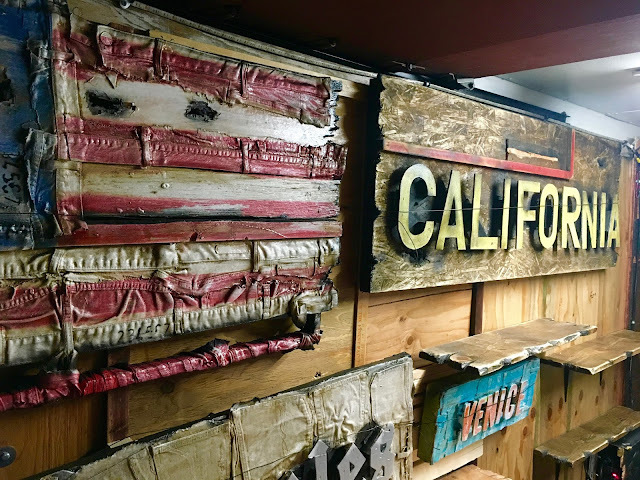 In a mad dash to see as much as I could, I race-walked down the street to Solé Bicycles, where they had already packed up, but I hopped into the truck of Flewnt to check out his cool Venice-centric work. I had missed the music and the gumbo, but it was still cool. I took off back toward Windward to see what else I could see that was still happening, and that's when I heard a gun shot and saw people running. Again in front of Surfside. WHAT is going on?! ENOUGH with the guns, People. So sick of it, and what a damper on what had been a wonderful night of celebrating Venice art. Geez. The interesting thing was that it didn't seem like people were all that phased. 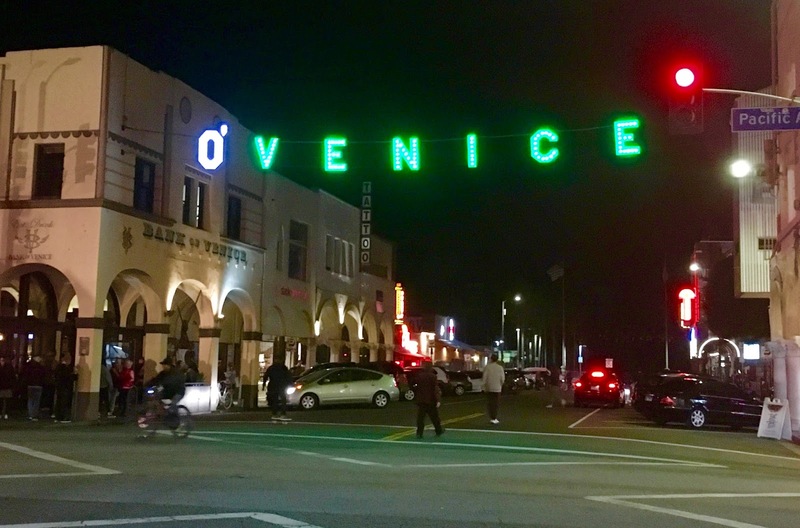 One dude got shot in the arm, and then people kept on partying under the shadow of the "O'Venice" sign, lit up green for St. Patrick's Day. And that's a good thing. We can't let the terrorists win - and that's exactly what gun-toting hotheads are. Sorry to any artists I didn't get to see, but ceremonies and shootings sometimes prohibit getting around to everything. I hope everyone has an excellent weekend, stays safe, and continues to create and appreciate art. It's what makes Venice go around. THANKS once again to the great organizers of the V.A.C. for another fantastic time - guns and all. Love you.